Sometimes we hear how people in the public sector make more than the private sector, or that big private sector earners don’t pay enough tax. This is a simple divide and conquer strategy where the end game is to make us all less well off in order for the Government to hold on to more resources and then pay for things in a demonstration of their own largesse. In every version of this script the State is the hero and the public and private sector take it in turns to be the greedy bad guys. Much of welfare funding, including many aspects of pensions, isn’t just about figuring out the strategy for preventing poverty in the first place, or curing it long term, or about reducing poverty in the elderly. It’s about feeding the ego’s of policy makers while using other peoples money. And by demonstrating how they, as a third party, can make the world a better place because they are the anointed ones who know best, but god forbid you ever dare to ask how this is all going to be paid for. If you do you’ll bear the wrath of every snake in the pit who is simply trying to hold on to their lot, not realising that life is better when you don’t get into the pit in the first place. Today we’ll take a look at pensions, and I’ll start by letting you know that where ever you work, and what ever you do that in time the state is going to shaft you. The Public Sector will receive their stuffing by having defined benefit ended, having to fund their own retirement, and ultimately realising that their standard of living will drop. 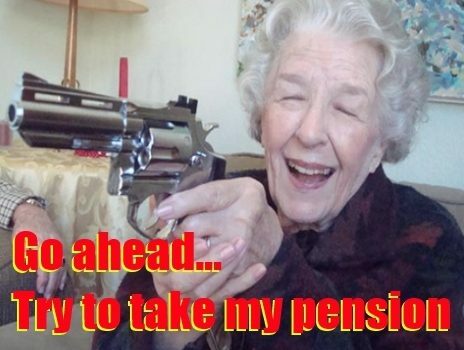 The private sector will have the same, already the state has robbed (because that’s what you call taking something with the threat of force – such as mandatory confiscation – and where the person you take it from doesn’t consent) private sector pensions, in a Robin Hood scheme called the ‘pension levy’. The next target will be lowering tax relief, as if half of people not funding for a pension wasn’t bad enough that you then take away every incentive ensuring a higher state burden in the future. But the theft doesn’t stop there. Look at the current public sector ‘pension related deduction’ – what a farce! It’s just a pay cut, and it’s not going to their pensions, or even a fund, it goes into day to day government spending, if as an employer, this was given the same scrutiny that pension contributions are given in the private sector then the Government would be imprisoned for a massive Bernie Madoff style fraud. It would be considered flat out embezzlement. Solution? The government, who make the laws, exempted themselves from this kind of prudential oversight, of course that’s the answer when you make the rules, ‘all rules don’t apply to the rule makers’. Soon the realisation of working many years more, for a smaller pension that you will have paid far more for than your predecessors will sink in. This storm is coming but it’s still in the distance. The private sector don’t have it easy, stock crashes, government theft, high taxation which makes funding hard and the whims of policy are all risks and problems. But they also get a state pension and nobody ever factors in the cost of that into their benefits. You see the Irish Government, in a rush to placate voters by giving away money, have promised almost everybody a good cash flow in retirement even if they never paid a penny in tax in your whole life. The state pension – even the non contributory one for people who never made any provision for retirement is worth between €240,000 and €400,000 depending on what measure you use. Imagine how great this must be to a lay about? Do nothing, get something worth almost half a million. Public sector get hammered too though, they have less flexibility, if they died shortly after retirement their pension (a spouses one) would half, and if they were single though it evaporates, meaning a well intended aunt or uncle might not have much of an estate to pass on to a favourite relative. In the private sector they could have a lump sum fund that goes to their estate as long as it wasn’t an annuity contract. While it is true that public sector pensions are ‘gold plated’, they only come in one model, and that has consequences. Private sector workers could opt to keep their money as a fund that they control (approved retirement fund), something state workers are denied. In public versus private, it’s really about defined benefit versus defined contribution. The reality is that employers can’t afford to do this – even in some of our most profitable companies, so how does the state plan to do it? Simple… taxation. The government is making promises they can’t keep, they are not putting anything aside to do this, but it’s future government and future tax payers that will get hit with the problems and the bills. It’s a perfect policy, be popular now, generous in the present and then let somebody else take the fall when you are long gone into the sunset. That’s the problem with promises that can’t be kept, somewhere down the line you have to come clear with them, but who will be in power when that happens?